A 52 year old woman, no matter now well trained, would be hard pressed to keep up with young men who make up the majority of violent criminals. 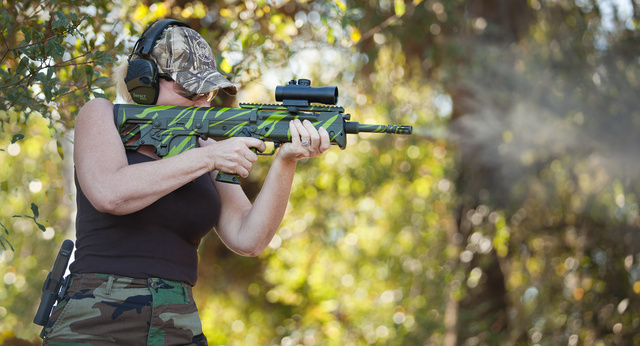 Add a Glock to her hip and a .308 rifle to her hands, and the balance shifts in favor of the well trained — in this instance, the lady in the photo. Gun is Civilization. This entry was posted in interesting people, pistol, rifle, rkba, self-defense and tagged 308, 9x19, bullpup, RFB. Bookmark the permalink. Excellent Christmas present for us. Thanks Oleg. That 52 year old is beaming. Whether 9+.308 is .665 cal or 16.62 mm, the force is with her. I love this photo. Thanks for posting it on Christmas and “making my day”. There is no doubt that firearms in the hands of the capable woman, are the great equalizer. I am trained and when necessary, I would not hesitate to exert deadly force to protect my loved ones! !